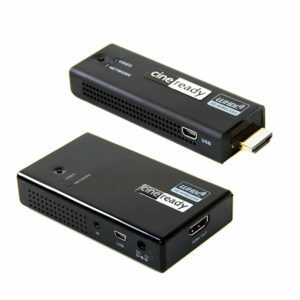 Cineready W-HDI transmits uncompressed full HD 1920×1080 of 50 meters (160 feet) in free line of sight and min. 30 meters in an environment with interference or items blocking the signal physically. The image is clear and disturbance free with a latency of less than 2 milliseconds, the blink of an eye is 400 milliseconds. It’s compact and light weight design make both the receiver and transmitter easy to attach to your camera rig. The signal is transmitted in the 5GHz range to limit to a minimum any interference from other devices. Both devices need 5V/1A power input, there is no internal battery. The receiver can only be powered through the coaxial DC input. You can use the included DC adapter or use an external power source. The transmitter has a mini USB port for power input. Most cinema cameras feature a USB power output, if this is not the case you can use a 5V power bank.